NATIONAL NETWORK OF FISCAL SPONSORS (NNFS) — This network of fiscal sponsors from around the country, which we at Community Partners helped start up back in 2004 and currently serve as chair of the steering committee, continues to flourish. 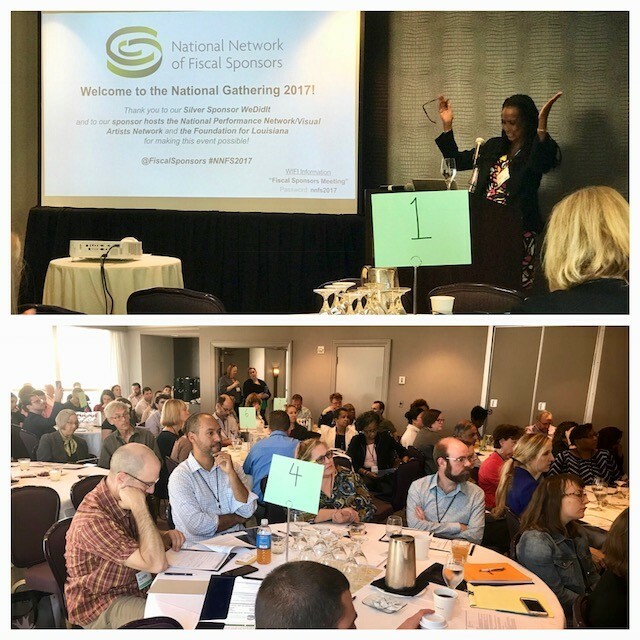 This year’s annual gathering, now a two-day conference, brought together 120 staff members affiliated with 62 organizations from 18 states. Held in New Orleans this past October, the conference offered an opportunity for networking and inspiration, along with deep discussions about the ins and outs of running fiscal sponsorship programs. This year’s keynote speaker, Flozell Daniels, Jr., CEO of Foundation for Louisiana, shared his organization’s experience in sponsoring a project to remove four confederate monuments in the city. It highlighted the potential for fiscal sponsorship as a mechanism for bold activism and community change. Community Partners staff members Dianne Debicella, Lauren Kay, and Sheri Dunn Berry all presented during break-out sessions; Jelyn Hermosa served on the planning committee. Sheri, as our rep to the steering committee, also opened and closed the event, noting that NNFS continues to grow in the diversity of its membership and leadership. In Detroit, Community Partners CEO Paul Vandeventer and Vice President Linda Fowells attended INDEPENDENT SECTOR’S annual conference, along with nearly 1,500 other nonprofit and foundation representatives from around the country…Communications Director Lauren Kay was in Miami, in September, for the COMMUNICATIONS NETWORK conference, which brings together communications professionals from foundations and nonprofits across the country…our new Melon/ACLS Fellow Chikako Yamauchi was in D.C. to learn from evaluation scholars, students and users from around the world at the national conference of the AMERICAN EVALUATORS ASSOCIATION…Linda Fowells and Phyllis Owens attended the MILKEN INSTITUTE’S California Summit, which brought together leaders in business, government, academia, and philanthropy for wide-ranging discussions about the state's future…and finally, we’re looking forward to hearing what program director Phyllis Owens learns from her current trip to Trieste, Italy where she and a delegation from Los Angeles are exploring that city’s model approach to mental health care delivery.